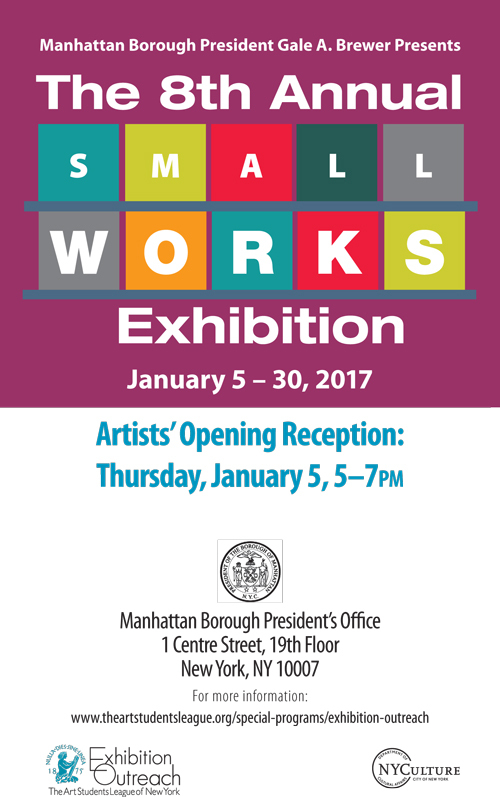 A small acrylic on canvas painting, which is really tiny for my work, it is only 8″x 10″!, has been chosen for inclusion in this show at the Manhattan Borough Presidents Office in January 2017. All of the works are less than 12″x 12″. This is very charming for a big city officials office! 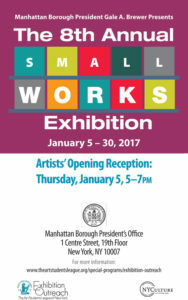 If you would like to attend the opening, please conract me privately. I participated in The Holiday Show in The Phyllis Harriman Mason Gallery, West 57th St, in December 2016, and spent the last weeks in Scotland, enjoying the spectacular, gloomy, foggy Highlands in winter and then touring through the English countryside. It was a trip full of diffuse, gentle light and and an intense, close palette of color in the deep shadows of the woods. It was so different from high/sharp contrast New York City! It helps you to rethink shadows once again. Even the air itself was soft…so moist and misty. Now back into the studio for the new year.